Often the first major decision teenagers face in their lives is where to attend college. A new summer program from Boyce College will make that decision easier. The Boyce Academy, starting in the summer of 2018, promises to give rising sophomores, juniors, and seniors the chance to experience a Christian college campus while earning course credit, announced R. Albert Mohler Jr. today. Evangelicals and Southern Baptists are similar but distinct movements in conservative Christianity. Despite their differences, the two groups can remain complementary forces in the advance of the gospel, said David W. Dockery during the 2018 Norton Lectures at The Southern Baptist Theological Seminary, March 27-28. Both groups need to listen, eliminate stereotypes of the other, and work together and co-laborers for the growth of the kingdom, Dockery said. “If we are willing to put aside our differences, we can mutually benefit and learn from one another,” he said. Evangelicalism has primarily functioned as a parachurch organism marked by its transdenominational character, argued Dockery, president of Trinity International University in Deerfield, Illinois, and a former Southern Seminary faculty member. During the series of revivals during American history, from George Whitfield to Billy Graham — evangelicalism functioned without a developed ecclesiology, leading to inefficient church structures. Because of this, denominations remain important, Dockery said, because Christianity needs structures to survive. Duplicated effort, funding challenges, and mixed loyalties can hold the church back. Evangelicalism is entrepreneurial in spirit and marked by a transdenominational character, according to Dockery. It provided the alternative to Christian fundamentalist separationism in the late evangelist Billy Graham, who gave the evangelical movement its open-hearted posture. Historically, the evangelical movement emerged out of the fallout from the fundamentalist-modernist controversy in the early 20th century. In 1919, W.B. Riley — one of the heroes of the fundamentalist movement — argued that fundamentalists should emphasize more than doctrinal conviction. They also should also prioritize separation, he said. In response, evangelicalism pushed for ecumenism and non-separationism. The most obvious practitioner of this was Graham, whom fundamentalists rejected as apostate. Graham’s theological fidelity (contrary to liberalism) and ecumenical spirit (contrary to fundamentalism) light the way of the church forward. While the Southern Baptist Convention has long exemplified structural efficiency, its theological legacy has been up and down. It was founded on firm convictions regarding the infallible truth of Scripture, but veered away from that before the ship was righted in the second half of the 20th century. In his lectures, Dockery described the history of the Southern Baptist Convention and biblical authority, tracing the changes in understanding of the doctrine of Scripture from the 19th century to the present. “For nearly 60 years, the SBC has lived with public controversy, regarding issues related to biblical authority, theological challenges, and denominational polity,” Dockery said. The SBC entered second half of 20th century as a unified and efficiently run denomination, Dockery said, but the years between 1954 and 1979 brought controversy and questioning of the authority of Scripture from thinkers who emphasized the element of human authorship in the Bible. In 1979, a movement in the SBC called for a return to Manly’s position on biblical authority. Decades of discussion and controversy culminated in a firm stance on biblical authority in 1993, when R. Albert Mohler Jr. was elected president of The Southern Baptist Theological Seminary. “He was elected with a commitment to the inerrancy and authority of Scripture and a commitment to the importance of the Abstract of Principles,” Dockery said. In light of its own theological reformation, the efficiency of the Southern Baptist Convention can go hand-in-hand with the open-handed evangelical movement that inherited the theological legacy of the Protestant Reformation. Dockery dedicated his 2018 Norton lecture series to Mohler, who celebrates the 25th anniversary of his election as the ninth president of Southern Seminary this year. While the Southern Baptist Convention has long exemplified structural efficiency, its theological legacy during the 20th century was up and down. It was founded on firm convictions regarding the infallible truth of Scripture, but veered away from that before the ship was righted in the second half of the 20th century through the Conservative Resurgence. In his lectures, Dockery described the history of the Southern Baptist Convention and biblical authority, tracing the changes in understanding of the doctrine of Scripture from the 19th century to the present. The two movements — the Southern Baptist Convention and broader evangelicalism — can cooperate for the growth of the kingdom, he said. Dockery has lived out the balance between the Southern Baptist Convention and evangelicalism in his own academic career, having participated extensively in both Baptist institutions and the evangelical guild. He has previously served as a faculty member at Southern Seminary, the flagship seminary of the SBC, and is currently president of Trinity International University, a flagship institution of the evangelical world. He is also the president of the Evangelical Theological Society and has served on numerous Southern Baptist committees. Russell Moore thinks loneliness can save your life. Weakness and irrelevance, too. He explained this to a filled Alumni Memorial Chapel at The Southern Baptist Theological Seminary during a March 20 chapel service. Moore, who is president of the Ethics and Religious Liberty Commission of the Southern Baptist Convention, preached a chapel sermon from 1 Kings 19:1-19. In this passage, the prophet Elijah finds himself a fugitive from the people whose God he just defended. Moore suggested that Christians should view Elijah’s isolation — his loneliness, weakness and irrelevance — immediately following his confrontation with the prophets of Baal as paradigmatic for life of following Jesus Christ. Christians should love the Word of God because it is what God uses to bring his people to belief in Jesus, said Daniel L. Akin, president of the Southeastern Baptist Theological Seminary during a March 13 chapel address at The Southern Baptist Theological Seminary. Christians should take their work seriously as one of three God-given spheres of responsibility, said Greg Gilbert during The Commonweal Project’s Spring Lecture Luncheon on Wednesday, March 7, at The Southern Baptist Theological Seminary. Gilbert, who is pastor of Third Avenue Baptist Church in Louisville, Kentucky, presented the first of two lectures based on his new book, The Gospel at Work, at the event. The second luncheon of the series will be held April 25. Experts in abuse prevention address how churches can prepare and respond to situations in their congregations. Christ took the exploitation of the vulnerable seriously, so the church is called to do the same, said Christian leaders during Counsel the Word at Southern Seminary, March 2-3. 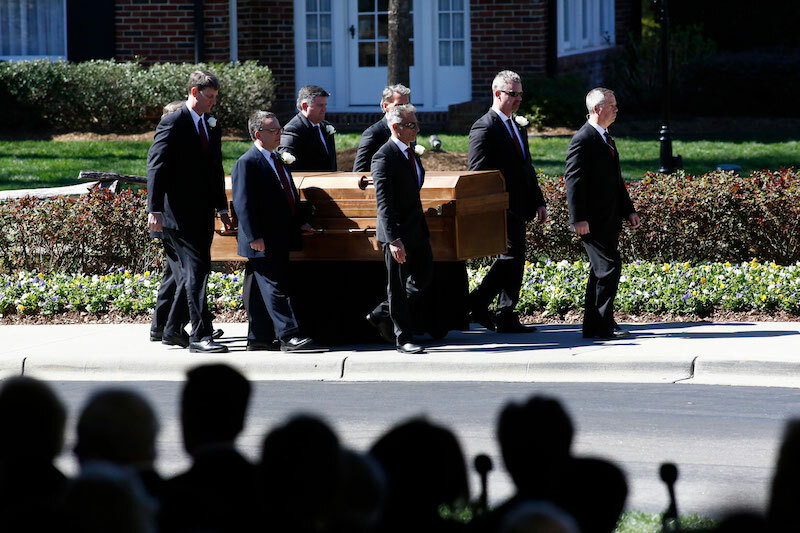 Family and friends celebrated the life of Billy Graham in a memorial service on the campus of the Billy Graham Library in Charlotte, North Carolina, on March 2. Described as Graham’s final crusade, the ceremony focused on the message that marked the evangelist’s life and ministry as the defining figure of 20th century American evangelicalism.